Perhaps you may have seen the title of my last blog entry and wondered what in the hell soju and Kimchi are. It's my hope your interest was peaked and if you didn't think it was worth the time to Google fear not I'm here to tell you. 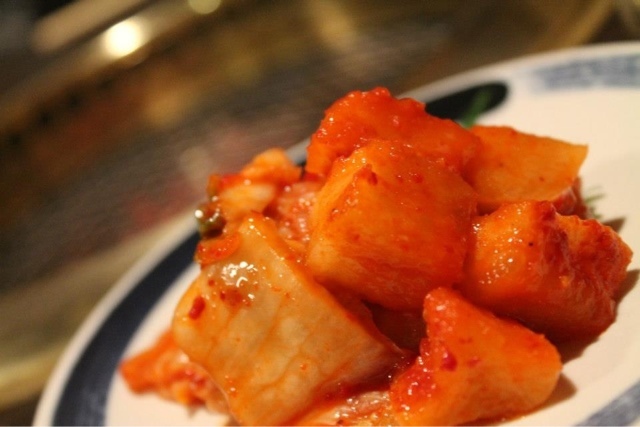 We will begin with kimchi (김치) which seems to be the more known of the two. Kimchi is essentially pickled cabbage covered in pepper sauce to make it kick-in-the-mouth spicy. There are hundreds of varieties of kimchi, some using vegetables other than cabbage. It's eaten in countries all over the globe but its main consumers are found in Asia specifically Korea, Japan and China. Traditional kimchi is allowed to ferment underground in jars for months at a time until it reaches the "just right" standard. It is typically eaten with every meal and can be made into a variety of dishes including: soup, stew, fried rice and even pancakes! (the pancakes are called Kimchi jjigae for anyone interested). Kimchi is also relatively popular here in Japan and can be found in any grocery store; although it goes by the slightly different name of kimuchi(キムチ). In recent years though much of the kimchi found abroad is made and processed in manufacturing plants in China (ah the joys of cheaper labor even come into play with kimchi). Before moving to Korea I had never even heard of this spicy dish sent from the heavens above. Nearly a year later I can't imagine living the rest of my life without it. Some folks, especially those sensitive to spicy foods, find it to be of a disagreeable taste. But, for those of us who enjoy the feeling of our mouths burning in spicy deliciousness kimchi is a cheap staple of life. Next up is soju (소주). 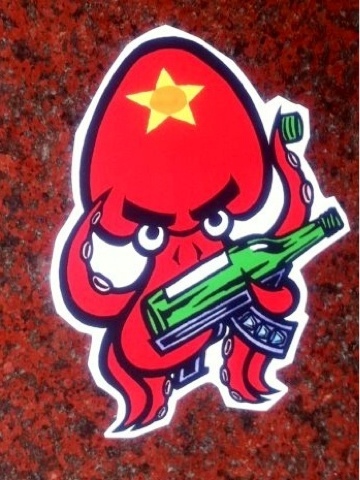 Now, soju literally means "burned liquor." Which I believe to be a rather good description of it. It tastes a bit like vodka but a tinge off due to extra sugar and/or other ingredients added in its production. It also lacks the "burn" vodka leaves in the mouth and throat, making it a dangerous affair on the nights you tango with soju. 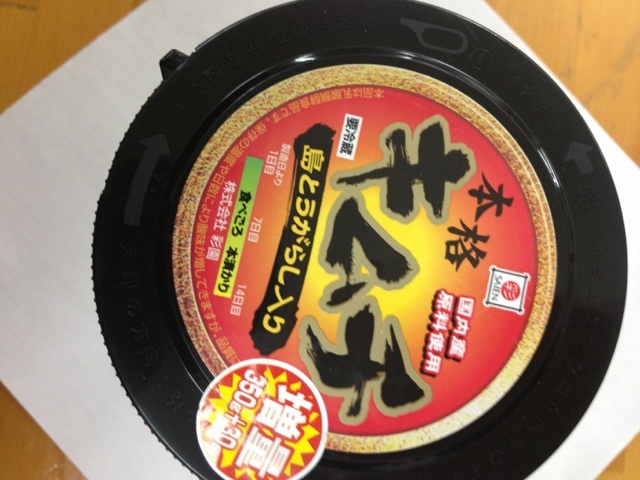 It can be taken as a shot, blended with juice or mixed with beer to create mekchu(sp?). It has an alcohol content of 16-45% and is dirt cheap to purchase. It costs about $1-4USD and comes in a variety of sizes, brands and flavors. My first dance with soju began a few days after I had arrived in Gimhae. I was invited out to dinner with a few foreigners and of course soju made its way to the table. I had my first shot and was surprised that it lacked the "burn" I had thought it would have. Needless to say I had a few more throughout the dinner thinking it to be a weak alcohol. Then I stood up. My mind felt fine but my body was feeling it. I had to fight to stay steady around my new companions and eventually made it to my hotel slightly wobbling the entire way. 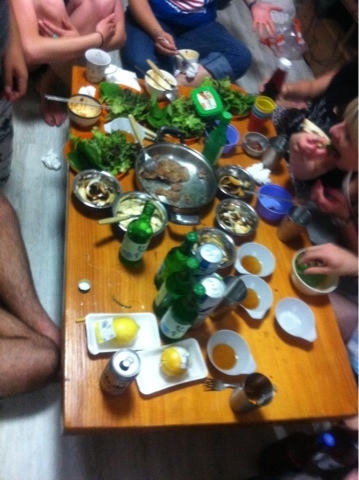 After that day consuming soju was a rather usual affair for the better part of my stay in Korea. Soju is a staple of adult Korean life. If you walk down the street and peer into the windows of restaurants or take a gander at the outdoor tables you will indubitably see the trademark green bottles littered across nearly every table. Young adults and those of a more ancient time have enjoyed and will continue to enjoy the sweet nectar of soju. But it's not only Koreans who enjoy soju. 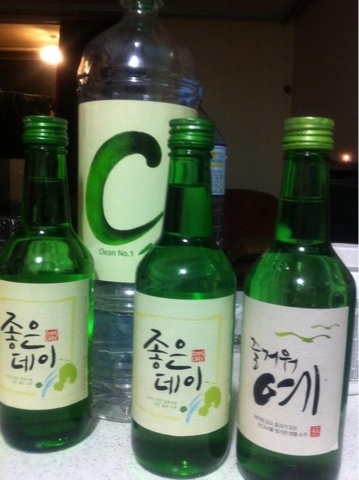 Worldwide two soju brands, Jinro and Lotte Liquor, sold nearly 90 million cases of Soju in 2011 (according to CNN these companies ranked first and third in worldwide hard liquor sales). Many of these cases did indeed stay within Korea but I would be hard pressed to believe if you have not run across soju at one time or another. If anyone is interested in trying this beverage it can be found most readily at Costco and is becoming increasingly popular at liquor stores across America.